Those arriving early enough will be able to park in the YMCA parking lot, however, most will have to park on the side streets and lots in the area near the YMCA. 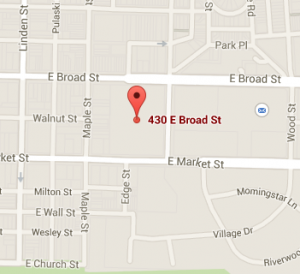 There is also a parking garage in downtown Bethlehem near New Street and Walnut Street approximately .6 miles from the YMCA. We recommend you consider car pooling and arriving early enough to find parking. Sorry, dogs are not currently permitted to participate. Yes, you may use a baby stroller. Use caution and be safe. If the temperatures are too cold or roads are snow covered we recommend you leave junior at home. Very scenic courses with some challenges along the way! 5-milers run along Main Street in downtown Bethlehem, decorated for Christmas, and have a very scenic run across the Fahy Bridge (see updated info on 5 mile course below) , headed toward the Bethlehem Star on South Mountain. The 5 mile and 5K events enjoy some time on scenic Sand Island running along the Lehigh River and run past Bethlehem City Hall, and many of the historic Moravian buildings. Click below to view. Course Map – 5-mile course has been changed due to bridge closure and is not reflected in the 5-mile course map in this link. 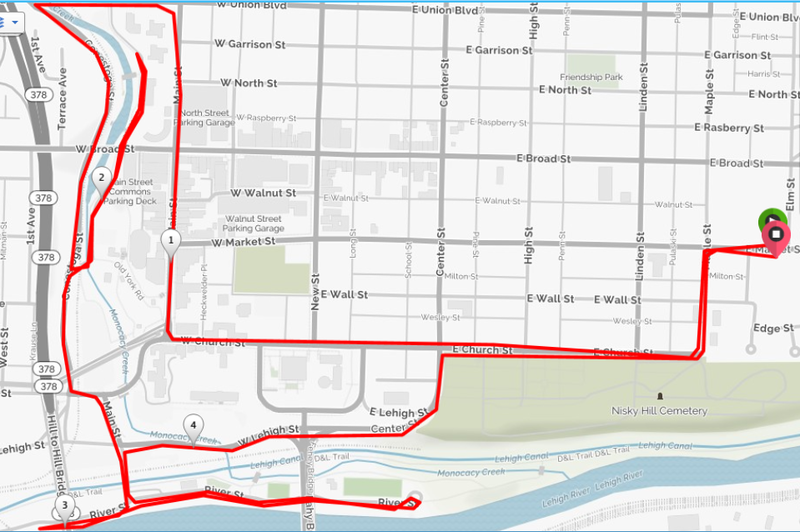 The 5K course map is correct and is the same as past few years. Course Turn-by-Turn – 5-mile course turn-by-turn has been changed due to bridge closure and is not reflected in this link. The 5K turn-by-turn is correct and is the same as past few years. UPDATED 5 MILER MAP: Here is the revision to the 5-Mile course due to the Fahy construction for 2017. As the 5-Milers come down Conestoga, they will turn left onto Ohio and cross the concrete bridge and then turn left up Old York Road to a turnaround point, then come back Old York Road, to Ohio, back across the concrete bridge and then continue on Conestoga. 5 Mile runners will also do a short out and back running west into Sand Island before coming back and running east to the water stop turnaround. Goodies- product samples, candy canes and other goodies while they last. Beautiful long-sleeved shirt or a beautiful 15 oz. 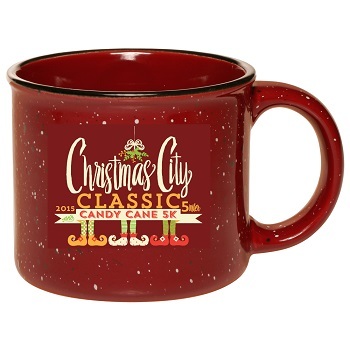 Ceramic Coffee/Hot Chocolate/Soup Mug with race logo, for pre-registered runners and walkers. (You’ll choose one or the other on Active.com when you register). Bagels coffee and hot chocolate station before the race. Delicious refreshments after the race including genuine Philly Soft Pretzels and Christmas cookies. Christmas music at Start/Finish and on course. Flush toilets inside the YMCA and port-o-johns at the Start/Finish. Friday and Saturday packet pickup available. COSTUME CONTEST– We will be observing individuals and groups in costume throughout the event and will select two individuals and one group (up to 4 people) to receive free entries to the 2018 race. Award winners will be announced on Facebook after the race! See the Fees and Registration Page HERE. Then see the Race Schedule Page for Packet Pickup Details and Race Day Schedule and Information.